Obesity is a worldwide problem with a significant presence in the United States. People with obesity are much more susceptible to developing health conditions such as high blood pressure, diabetes, and sleep apnea, as well as heart disease. Of these adverse health conditions, the risk of heart disease includes, but is not limited to, atrial fibrillation. Obesity has the potential to increase your risk of developing atrial fibrillation in a variety of ways. The heightened probability of developing health conditions due to obesity can lead to the development of atrial fibrillation. Even if other ailments do not occur, fat cells caused by obesity have been found to secrete inflammatory hormones, which can directly result in the development of atrial fibrillation. Obesity can lead to the development of a wide variety of health concerns and puts patients at higher risk of an AFib diagnosis. In this video I talk about the triggers for Atrial Fibrillation, and why it's important to know what they are. In today's video, I talk about the updated Atrial Fibrillation (AFib) guidelines for 2019, and why it's important to know. In this video I will discuss the common causes of atrial fibrillation. In this video I discuss my top 3 diet tips for atrial fibrillation. Why Does AFib Make You Short of Breath? In this video I discuss why Atrial Fibrillation (AFib), can make you short of breath, and some ways you can help it. Will The Apple Watch Change AFib Management? In this video, I'll tell you all about it. Information is strictly educational in nature. What are Symptoms of AFIb? In this video I discuss what the symptoms of Atrial Fibrillation are, so you know when to contact your doctor. WHY Does AFib Make You Feel TIRED? Why does AFib make you feel tired? In this video I discuss my tips and common questions regarding why patients with atrial fibrillation frequently feel tired. How Does A Cardioversion Help With AFib? In this video I discuss my tips and common questions regarding why patients with atrial fibrillation can see positive results with a Cardioversion. In this video I discuss my tips and common questions regarding How Sleep Apnea Affects patients with atrial fibrillation. How does sleep apnea affect AFib? Does treatment for sleep apnea help with AFib? Doctor AFib explains when you should go see an Electrophysiologist. I'll explain what an Electrophysiologist does and when a patient with atrial fibrillation or AFib should see one. In this video I discuss ways in which the Holiday Season can affect a patient's atrial fibrillation, from stress to travel to alcohol usage. I'll give you my tips to have a safe holiday season from atrial fibrillation. In this video I discuss how the cold weather affects AFib. I discuss how patients have more hospitalizations for atrial fibrillation during the winter and increased risk of stroke during the winter. For the full blog post on this video, click here. In this video I discuss the medication digoxin, a common medication used for atrial fibrillation. I will discuss the benefits and risks of this medication for AFib patients. For the full blog post on this video click here. In this video I will be talking about implantable cardiac monitors, also called loop recorders such as the Medtronic Linq and the Abbott Confirm Rx which are used under the skin to help management atrial fibrillation and other arrhythmias.. I’ll discuss indications for these devices and when I use them in my patients. In this video, I have a radio interview with Cox Media Group in Houston, to teach people about Atrial Fibrillation. In this video I discuss the role of magnesium in the management of atrial fibrillation. Does Magnesium deficiency affect AFib? Do Magnesium supplements help with AFib? Click here to read this video’s blog post. In this video I discuss the complex management for patients that have both coronary artery disease and atrial fibrillation, there are several key features that I discuss. I'll discuss the importance of the medications used including blood thinning medications. In this video I discuss tips for people who have loved ones living with atrial fibrillation. Thank you for all the support you give and educating yourself to help your loved one's AFib. For the accompanying blog post, click here. How Does Stress Affect Your Atrial Fibrillation? In this video I discuss ways in which STRESS can affect your atrial fibrillation and management tips to reduce your symptoms. Can AFib Give Me A Heart Attack? In this video I discuss if AFib can cause a heart attack and the known risk factors for atrial fibrillation and coronary artery disease. When Should You Go to Emergency Room during an AFib Attack? In this video I discuss tips on when a patient should go to the Emergency Room during an AFib attack. What Is An AV Nodal Ablation? How does an AV Nodal Ablation Treat Atrial Fibrillation? In this video I discuss important discussion points about a common treatment strategy for patients with atrial fibrillation called an AV nodal ablation. What Questions Should I Ask My Doctor About Atrial Fibrillation? In this video I discuss my questions you should ask your doctor about your atrial fibrillation. Can A Pacemaker Help My AFib? In this video I discuss how a pacemaker can be used in the treatment for atrial fibrillation. In this video segment we are going to talk about what precautions should a patient with atrial fibrillation take while on vacation. In this video I will discuss a very controversial question: Can atrial fibrillation be cured. Will AFib ever completely go away? Can Atrial Fibrillation Make You Pass Out? In this video I discuss possible ways a patient with atrial fibrillation may pass out or have syncope. I'll discuss how it is diagnosed and treatment options. In this video, I describe what a cryptogenic stroke and its connection with atrial fibrillation is. A crypotegenic stroke is basically an explained stroke, and can be linked to undiagnosed atrial fibrillation. How Can Weight Loss Improve Atrial Fibrillation? In this video I discuss how weight loss can improve atrial fibrillation. Are Palpitations The Same as AFib? In this video, I discuss the difference between palpitations and atrial fibrillation. Can I exercise if I have Atrial Fibrillation? In this video I discuss exercise tips for patients living with atrial fibrillation. How does Atrial Fibrillation progress? What are stages of AFib? In this video I will discuss the stages that AFib progresses. Why Should I Get an AFib Ablation? In this video I discuss reasons why a patient should consider an AFib Ablation. For many years doctors have advised overweight patients who developed atrial fibrillation to lose weight. This advice was supported in 2015, by a formative clinical trial, the Legacy Trial, which emphasized to doctors and patients why weight loss is such a crucial aspect of atrial fibrillation management. The Legacy Trial consisted of the observation of more than 1,000 patients over five years. The results of this study showed that patients who lost over 10% of their body weight had over a six-fold improvement in their atrial fibrillation; with many of the patients experiencing significant weight loss demonstrating no major atrial fibrillation symptoms. While the findings in the Legacy Trial are promising for the world of atrial fibrillation, not every instance AFib can be aided by losing weight. However, if a patient is suffering from obesity, weight loss can dramatically decrease their burden and improve AFib symptoms. The Legacy Trial shows that not only is weight loss crucial to the management of patients' atrial fibrillation but that it can also drastically improve the impact and frequency of AFib symptoms. Weight loss is a long-term management technique, as it can take years for patients to achieve and maintain their goal weight. While I’m sure it isn’t the quick fix you may have been hoping for, the scientific data from the Legacy Trial shows that reducing weight in an obese patient can show significant improvement in the amount of atrial fibrillation that patient experiences. Losing weight is easier said than done, but it is an important treatment strategy for the long-term management of individuals with atrial fibrillation. The keto diet for atrial fibrillation patients! My most commonly asked questions about AFib! Apple Watch Series 4 Review - Will it Help Atrial Fibrillation Patients? In this article I will be discussing the Apple Watch Series 4 and the new ECG features on the watch. How beneficial could this be for atrial fibrillation patients? How accurate is the Apple Watch to detect atrial fibrillation? In this article I will discuss my recommended diet tips for patients with atrial fibrilation. How Does an Implantable Loop Recorder Help Manage Atrial Fibrillation? These monitors are like the heart monitors that you have worn in your doctor’s office, except it's underneath your skin. You don't have to actually wear anything and you can go and do all your normal activities. These devices have a battery life that typically lasts for three years. 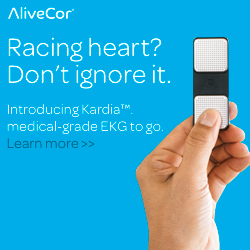 It can give your doctor a lot of information about how your atrial fibrillation is doing. Newer PostHow Does a Cardioversion Help With Atrial Fibrillation? Older PostCan Atrial Fibrillation Be Cured?